Tickets go on sale today for Ice Age: The Lost Kingdom,a brand-new, prehistoric, outdoor family attraction coming to the UK in 2019. Europe’s first touring animatronic Ice Age experience brings to life the sights and sounds of the Ice Age, with 40 majestic beasts that roamed the world some 70,000 years ago. An entertaining, educational and great value day out, where you can step back in time and wander amongst the life-size creatures, including mammoths, sabre-toothed tigers and giant sloths. All animatronic beasts have moving body parts, wide opening jaws and realistic sound effects to really bring the experience to life. 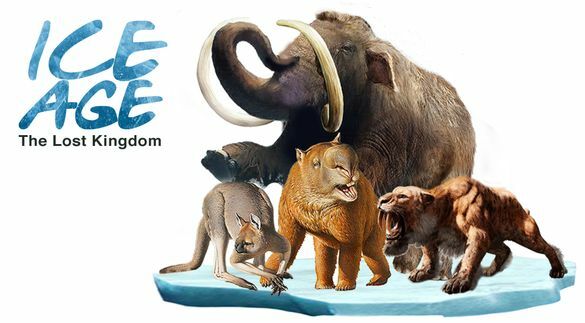 Ice Age: The Lost Kingdom will be touring the UK throughout 2019, beginning in London’s Gunnersbury Park on 6th of April and open to the public throughout the Easter school holidays: 6 to 28 April. The tour will go on to visit major city parks in Birmingham, Glasgow, Manchester, Nottingham and Leeds. A variety of street food outlets will be available at all locations, together with a mini-cinema marquee showing an educational Ice Age documentary, a fossil excavation pit for children to unearth skeletons and a merchandise trailer for souvenirs. Tickets for London go on sale today. If you book in advance online, adult tickets are £14.50, and children tickets are £12.50. An early bird discount of 20% is available for all bookings made before 28 February 2019. Use promo code: EARLYBIRD20. On the door prices vary. Ice Age: The Lost Kingdom will open at Gunnersbury Park, Gunnersbury, Popes Lane, West London W5 4NH. Open daily 6th to 28th April (except: 23rd and 24th April) from 10am to 6pm with last entry at 5pm. Visit iceagekingdom.com for more information and to book tickets. Weli Cultural Alliance, the team behind Ice Age: The Lost Kingdom, last year successfully toured the Jurassic Kingdom attraction around the country. There will be educational information panels next to each beast which have been thoroughly researched and written by Weli Cultural Alliance and verified by the Natural History Museum and the University of Bristol.